The Ghanaian healthcare system is not fully equipped to independently provide surgical services for the >5,000 children born with congenital heart disease (CHD) in the country each year. With this in mind, a Boston-based group named “The Hearts and Minds of Ghana” (HMG) began visiting Komfo Anokye Teaching Hospital (KATH) in Ghana in 2007. Since then, this team has worked with local healthcare providers during ~ 2 week long visits to provide surgical and perioperative care to these patients. Their efforts primarily focus on those whose life expectancy is estimated to be less than 1-2 years without corrective surgery. I was lucky enough to join this group on their annual trip this year. 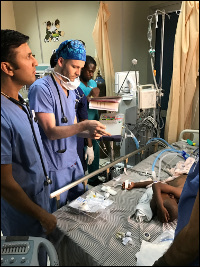 As one of only two anesthesia providers, I was able to play a central role in the perioperative care of all 11 of the kids that the group worked on during this trip. One of the patient’s caregivers told us she had never seen the 7-year-old child do anything more than walk and had never seen her smile spread across her young face before her surgery. At that point, two days after her surgery, she was giggling as we frantically tried to keep her from running down the halls. That was one of the most rewarding moments of the trip which helped to remind me why I got into medicine. For that, I give my most sincere thanks to you for your support which allowed this to happen.